A strong Swiss franc sent Roche H1 sales down 1 percent to CHF22.97 billion and core earnings per share (EPS) to CHF7.50, halting the recent growth in its breast cancer medications. Excluding the impact of a strong currency, sales increased by 5% and core EPS by 7%. Its new breast cancer medications performed well. The Swiss pharmaceutical giant said sales were down in local currency because the US dollar, several Latin American currencies, as well as the Japanese yen, weakened against the Swiss franc. A CHF404 million writedown on the company’s tissue diagnostics business pushed down net profit by 7% to CHF5.64 billion. The Basel-based multinational has several high earning medications which will soon reach patent expiry, allowing for a flood of generic alternatives to significantly reduce sales. It is pushing ahead with “follow-on” drugs which will hopefully maintain revenues in its blood and breast cancer businesses. Perjeta (Pertuzumab), a breast cancer medication which targets the same protein as the older best-selling Herceptin, posted a 276% increase in sales to CHF388 million. 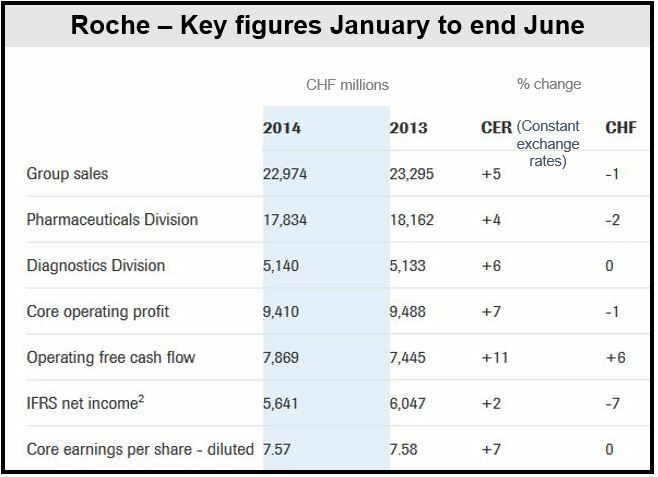 Herceptin (trastuzumab) is Roche’s third best earner and brought in CHF3.082 billion in revenue in H1 2014. Herceptin’s patent expires in Europe in 2015 and in the US in 2019. Sales of Kadcyla (ado-trastuzumab emtansine), also a breast cancer medication, increased from CHF83 million in H1 2013 to CHF227 million in H1 2014. Lymphoma drug Gazyva (obinutuzumab), which was approved by the US Food and Drug Administration in 2013, clocked up sales of CHF18 million in H1 2014. Roche hopes Gazyva will eventually replace the older drug MabThera. Earlier this month, Roche and Seragon Pharmaceuticals, a San Diego-based company, agreed on an acquisition valued at about $1.725 billion.